A man unhappy with the alleged sub-standard quality of his brand-new serviced apartment vented his frustration the only way he knew how - by taking a sledgehammer to the floor and spray paint to the furniture. In a video which has gone viral on social media, the man, believed to be Malaysian, first demonstrates the difficulty in opening and closing the bedroom and bathroom sliding doors. 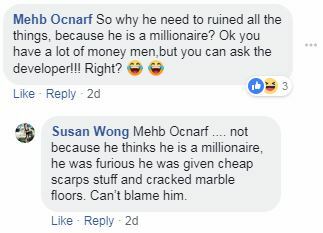 With a can of red spray paint in hand, he shows his displeasure over the flooring defects by spray-painting on the marble tiles found to be cracked or chipped, while complaining, "You sold this to me at RM2 million?" The property in question appears to be the freehold Tropicana The Residences condominium located in the heart of Kuala Lumpur. A check online showed a one-bedder 714 sq ft unit going for RM1.8 million (S$591,474). Things took a more drastic turn in the video, where the man is seen wearing protective headgear and eyeglasses. Turning his attention to a sidetable which appears to be detachable from the headboard, he noted: "Impeccable taste? This is an afterthought." He then picks up a chair and throws it against the wall. 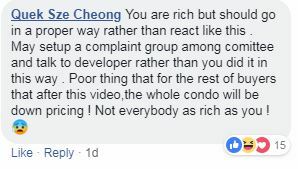 In the next frame, the man again complains about the development being marketed as "luxurious" and "the ultimate lifestyle". "You give me this kind of sofa," he says, before spray-painting over the couch. "You don't even have a curtain rod, you call this a luxurious apartment," he vented, marking a red "X" on the curtains. "This is definitely not acceptable to me." "We operate a company, we have to make money, but please don't be so cheapskate," he continued. In the final few minutes of the video, the man rants: "Your 'impeccable taste', you want me to accept, I don't accept... I don't need you to pay me, I don't like it," adding that he intends to use the trashed apartment as a "showflat" for other potential buyers and owners. In a Hulk-smash moment, he launches a sledgehammer at the furniture, as tiny fragments scatter all over the floor. His tirade continues with him bringing the hammer down forcefully on the tiles. In a twist however, the developer, Tropicana Corporation Berhad, clarified in a Facebook post on Saturday (April 13) that the man in the video is not the unit's current owner. They wrote: "The individual who performed destructive acts in the unit is the representative of the unit’s current owner. Our team is still attempting to connect with the rightful owner and we will do our best to assist in any possible way. "We are deeply mortified and affected by this untoward incident, and we apologise to anyone that has been affected by it." 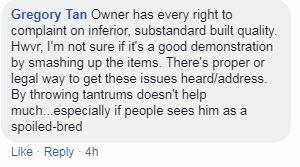 While some Facebook commenters appeared to empathise with the man and his emotions, many felt he could have handled the situation better instead of taking it into his own hands, literally. Perhaps someone should introduce him to a proper rage room, pronto.